Gov. Andrew Cuomo called his Republican challenger, Marc Molinaro, an acolyte of President Donald Trump, and Molinaro punched back by assailing the Democrat as corrupt as the two candidates faced off Tuesday at their only scheduled debate before next month's election. The exchanges between the two men were sharp and unfriendly. Cuomo, at one point, called Molinaro Trump's "Mini-Me," a reference to the evil sidekick in the Austin Powers movies. Molinaro brought up the recent criminal conviction of a close Cuomo aide, Joseph Percoco, who traded influence for money and a cushy job for his wife. "Governor, you have led the most corrupted state government in America," Molinaro said. "At what point, after eight years of being in office, do you take responsibility?" Cuomo, looking for his third term, sparred with Molinaro, the Dutchess County executive, at the CBS Broadcast Center in Manhattan. The debate was scheduled to be webcast and televised at 7 p.m. on several CBS affiliates. Cuomo is far ahead in the polls and in fundraising and until this weekend showed little interest in debating his lesser-known Republican challenger. During the debate, Cuomo made Trump, who is unpopular in the most densely populated parts of the state, the central target of his attacks. "The extreme conservative wing that Mr. Molinaro and Mr. Trump represent exclude everything. They're anti-women. They're anti-LGBTQ," Cuomo said after a question about education policy. He brought up votes Molinaro had taken in the state Assembly, including one against a bill barring the use of handcuffs on pregnant inmates in labor. Molinaro said at the time that he did so because he thought doctors and corrections officers should have some discretion, for safety reasons. At one point, Cuomo asked Molinaro repeatedly if he supported Trump. Molinaro refused to answer, instead saying that he supported policies that would strengthen the country's economy and that New York's economy was lagging behind. Molinaro, who has said he did not support Trump in 2016, criticized Cuomo's handling of the upstate economy and property taxes and accused him of abandoning responsibility for the Metropolitan Transportation Authority, the agency that oversees New York City's beleaguered transit system. 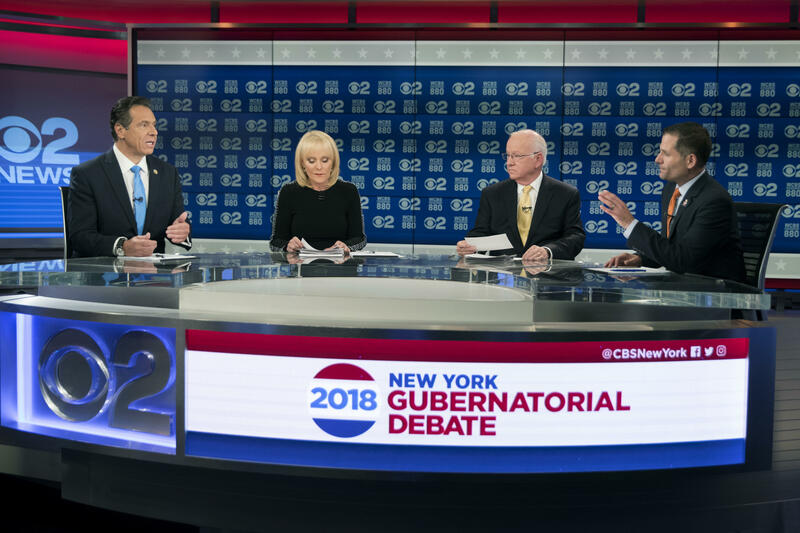 The debate didn't feature the three third-party candidates: Libertarian Larry Sharpe, Green Party nominee Howie Hawkins or former Syracuse Mayor Stephanie Miner, an independent.